If you’ve been to the San Francisco Bay Area, you know how time-consuming it can be to get to the South Bay from anywhere in the region. 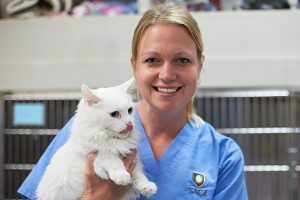 Still, every day, people make the trek to SAGE Campbell so their pets can receive conventional radiation therapy, which means 16 to 19 anesthetic events and treatments. When the commute becomes too much, some pet parents opt to board their pets. 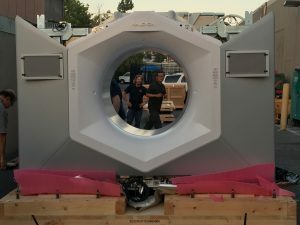 In August 2017, pet parents will have a new option when SAGE Centers becomes the first veterinary hospital in the United States to use The Halcyon™ system, Varian’s newest cancer treatment device, to deliver stereotactic radiosurgery (SRS) to patients. Doctors have used SRS for years in human medicine, but it is relatively new in veterinary medicine. It is an advanced form of cancer treatment—an entire treatment course is delivered in just 1 to 3 treatments, an 80 to 95% reduction in anesthetic events when compared to conventional radiation therapy (RT). SAGE Campbell will deliver SRS through our collaboration with PetCure Oncology. The availability of SRS will allow pet parents from all over the Bay Area to minimize treatment times, anesthetic events, and time on the road transporting their pet to appointments. This means pets get to spend more time at home and less time at the veterinarian’s office. The Halcyon Treatment System being delivered. SAGE Campbell will continue to provide the more traditional forms of radiation therapy, as we always have. But the addition of SRS to our existing list of in-house treatment options means we will be able to treat a wider variety of cancers using non-invasive means with precise treatments tailored to each pet and their tumor. Depending on the case and doctors’ recommendations, SRS can be used in areas that weren’t previously resectable or treatable. The ability to deliver SRS puts SAGE at the forefront of cancer treatment for animals. We’re incredibly excited to make this service available, and we welcome your questions. Contact SAGE Campbell at 407-343-7243. You can learn more about SRS and conventional radiation therapy on our website at SAGE Advice. Blog Contributor: Gina Gotsill, Marketing and Communications Specialist, SAGE Centers.